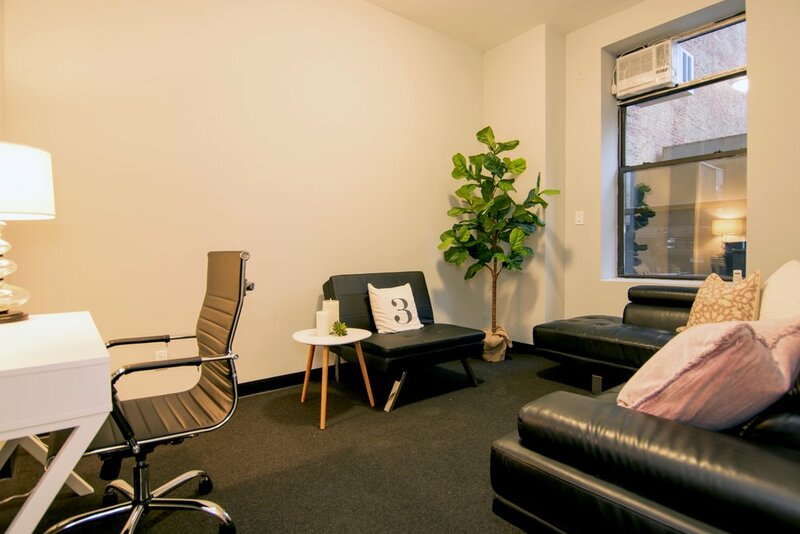 6 Beautiful Psychotherapy Offices on 5th Avenue between E34th and E33rd. Convenient 6th floor suite, huge windows and chic and inviting decor. NYC Psych offices. Available full time, unfurnished therapy offices designed by therapists. Every possible amenity- Kitchenette, micro office, 24/7 doormen, keyless intercom entry, free WiFi, free cleaning & free mail services. Located directly across from one of New York City’s most iconic buildings, this office is all about location and transportation. This six office suite is brand new and features high-end, modern furnishings and details including uniquely stenciled accent walls. With endless transportation and food options, our Empire State Building location is not only beautiful but also includes many amenities. There is a 24/7 doorman, free WiFi on separate connections for therapists and clients, keyless entry, a fridge and Keurig machine, water cooler, printer with fax and scanner capabilities, and high speed elevators.